God, poor Angela Merkel. In addition to having to endure a prolonged visit with a bloviating chicken wing last weekend, that chicken wing also had the gall to hand her an invoice for $374 billion, the sum that Germany reportedly “owes NATO,” plus interest. Well isn’t this mortifying. The backstory is that in 2014, NATO countries pledged to spend two percent of their GDP on defense, though only a small number of them actually do. Trump, perhaps struck by inspiration on his dozenth round of golf at Mar-A-Lago, reportedly asked aides to calculate how much German spending fell below two percent over the last 12 years—with interest. 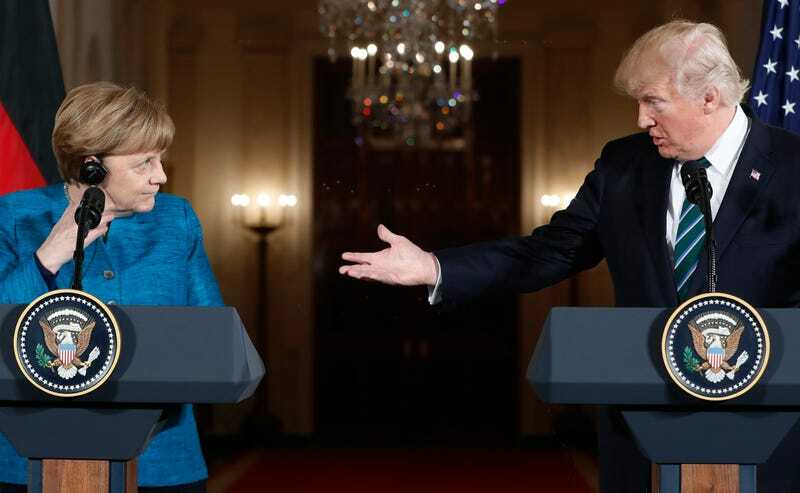 The resulting figure was what Trump scrawled on his “invoice,” which I guess he tossed into Merkel’s face while refusing to look at her. As CNN points out, Trump seems to have a fundamental misunderstanding of how NATO works (surprise!). The two percent figure is merely a target for the amount that countries should spend on their own defense, the theory being that each nation should be as well-positioned as possible in the event of an attack. The U.S. spends 3.61 percent; Germany spends 1.2 percent. But that money doesn’t go to NATO—it goes toward an individual country’s own armed forces. For the record, France, Turkey, Italy and Canada are also spending below the two percent goal, so they can look out for their own personalized invoices in the mail any day now, which they can throw straight into the fire.